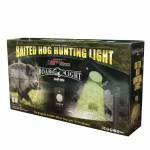 The ASF Boar Light is the perfect light for serious hog hunters! With motion sensor activation and continuous use solar panel, this light is sure to be your new favorite hunting accessory! Easy to install and no bulky battery to hook up! Just mount it to a t-post, and you're ready to rock! Green light automatically comes on at dark and brightens with motion (from 450 lumens to 650 lumens) Solar charging back panel provides years of maintenance free use Conditions your animals since the.. 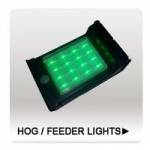 The Lil' Squealer hog light is the perfect compact Green LED light for hog hunting! With three simple settings, you are able to set the activation up the way you prefer, ensuring you have a great hunt! Easy to install and no bulky battery to hook up! Just mount it to a t-post, and you're ready to rock! 3 easy settings: High Power w/ motion, On at dusk for 4 hours at Low Power, On at dusk & brighten to 450LM w/motion High Power is 450 Lumens, Low power is 200 Lumens Light will only com.. Mounts to the bottom of the American Hunter feeder kits as well as other brand feeders with the included universal mounting bracket. Provides abundant light for night time hog hunting. 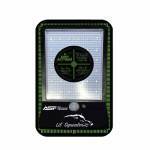 36 Green LED ‘s 360 degree PIR Motion Sensor CDS Light Sensor High 100% / Medium 60% / Low 30% light power Fade on / off light activation 180 seconds of light per triggering Weather resistant ABS housing Extreme temperature rated -4ºF – 140ºF Universal mounting plate Includes 4 mounting scr.. The ideal accessory for night time hog hunting. Features high powered LED lights (green) to light up the area around your feeder. 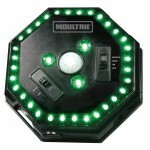 Motion, photocell and manually-activated feeder light 35 high-powered, green LEDs illuminate game up to 30’ Power port for optional external 6v power source Attaches to most Moultrie feeders and is compatible with other game feeders Operates on 4 C-cell batteries (not included) (runs 5 hours on high, 20 hours on low) .. This hog light is a must have for night hunting hogs around feeders. 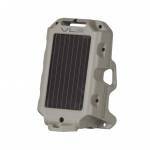 Built in solar panel and rechargeable battery keep the unit charged up for night time hog hunting. Works well for eradicating racoons also. Motion activated sensor turns light on when hogs and varmint are present. Green LEDs provide good light without spooking the wildlife. 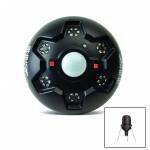 For Hog, Predator and Varmint Hunting Easy installation on any feeder Motion Activated with a PIR Sensor On/Off Switch when not in use Built..